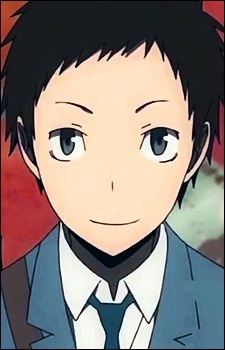 The primary male protagonist of the series, Mikado Ryugamine is a high school boy who moved to Ikebukuro with the encouragement of his best friend Masaomi in order to search for unusual beings and adventure. Mikado tries hard to change his image but so far he has not had any luck. Mikado has had moments where he speaks his mind, which is a reason why Masaomi admires him. He is the creator and the leader of the anonymous online gang: Dollars. He doesn't have much authority inside Dollars, since he believes Dollars is a group 'without rules'. However, Mikado changes his mind after Dollars is corrupted by its bad members. He becomes the leader of the Blue Squares gang, which has largely infiltrated Dollars, after being offered the position by Aoba. In the light novel Volume 6, he is shown to have a darker side or true self, being able to stab Aoba's hand with a ballpoint. Aoba notes that maybe Mikado has yet to show his true self.